The Dura-Mag 2 Position Digital Magnetic Stirrer provides reliable magnetic stirring with the ability to stir two vessels simultaneously. This low profile magnetic stirrer employs a brushless DC motor with drive assembly for quiet operation, a stainless-steel cover with stamped in positioning markers for the best placement and efficacy. Digital read out screen and dial of this lab stirrer help you accurately choose your desired speed. The maximum flask size supported by this laboratory stirrer is up to two 8 L vessels and operates with a speed range between 5-400 rpm. 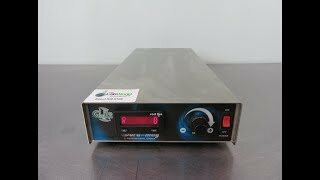 This Dura-Mag 2 Position Digital Magnetic Stirrer has been fully inspected and is performing as it should. All of our lab equipment comes backed with our standard warranty. Should you have any questions, please don't hesitate to contact us.